The 28000 ha Mountain Zebra National Park in South Africa is beautifully situated within the Eastern Cape Midlands 25 km west of the town of Cradock and not that far from Graaf-Reinet. Originally, the park was established purely for protection of the near extinct Cape Mountain zebra. A few decades ago only less than 20 individuals of this highly endangered zebra species had survived extinction. Today the beautiful Mountain Zebra National Park is home to a unique and growing population of rare Cape Mountain Zebras. 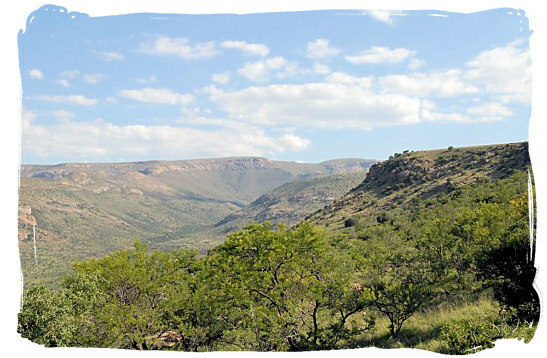 It is one of the smaller national parks in South Africa with its own special, intimate atmosphere. 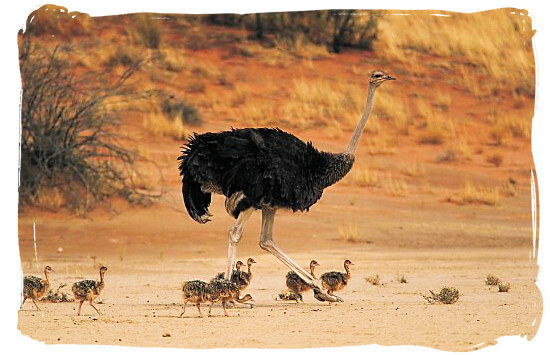 It is also one of South Africa’s least known national parks and at the same time one of its most rewarding ones. The Park,... Next to housing a wide variety of wildlife and featuring the endangered Cape Mountain Zebra, the Park is also home to prehistoric sites with concentrations of stone artifacts along the river banks, rock paintings on the mountain slopes and historic farmsteads and cemeteries. A showcase of thousands of years of human history. The highlight of the park’s mammalian fauna is obviously the Cape Mountain Zebra after which the park is named. Smallest of all the zebra species, they covered much of the Cape region. It came close to extinction when during the 1800s and the early 1900s large numbers were killed off by humans, leaving a number of 400 survivors. 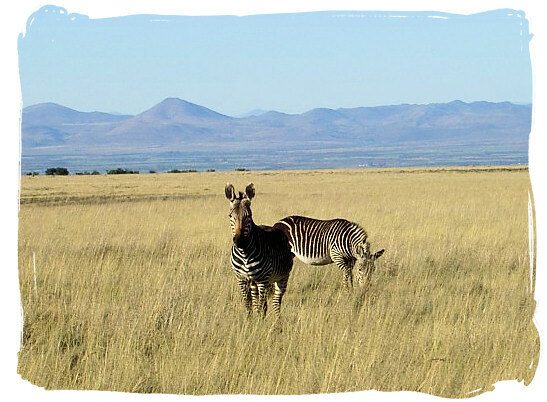 In 1937 the Mountain Zebra National Park was created to halt the decimation of the nearly extinct species. Having started with 25 individuals, the population of the Cape Mountain Zebras in the Park currently stands at approximately 300. This species is the rarest, smallest and most beautiful of the zebras, only 1,2 m high with stunning geometrical stripes, completely different to those of any other zebra species. In fact, each of the zebras is unique and identifiable by its stripe pattern. They mainly eat grass but if little food is left they will eat bushes. Next to providing a sanctuary for the rare Cape Mountain Zebra, The Park is also home to herds of Eland, Springbok, Kudu, Blesbok, Cape Buffalo and Red Hartebeest, to name but a few, and smaller predators such as the Cheetah, Caracal, Brown Hyena, African wild cat, Bat-eared Fox and Aardwolf. Add to that the rare Black Rhino, Black Wildebeest and Grey Rhebuck species in the higher lying areas and the picture is complete. 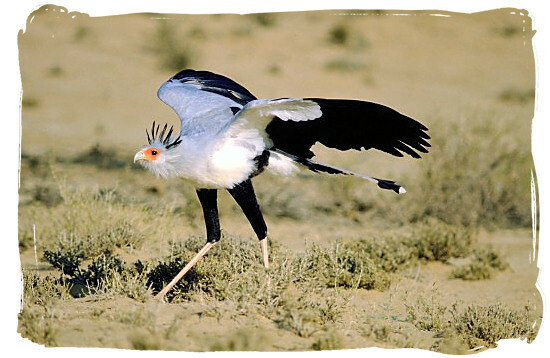 Set within the rugged heights of the Bankberg mountains amidst prolific flora and fauna, the Mountain Zebra Park is a bird lovers paradise, boasting an abundance of bird life. With more than 200 bird species, birders will have a great time spotting Blue Crane, Booted Eagle and Black Eagle amongst others. The wooded kloofs and acacia stands host species such as Red-fronted Tinker Barbet, Lesser Honey-Guide, Red-throated Wryneck and Southern Tchagra. Verreaux’s (Black) and Martial Eagle and Jackal Buzzard soar impressively over this mountain habitat. Pale-winged Starling is very conspicuous on the mountain plateau, where Ostrich, Secretary bird, Blue Crane and Ludwig’s Bustard are the larger more visible species. Grey-winged Francolin, Ground Woodpecker, Large-billed (Thick-billed) and Eastern Long-billed Lark, Cape and Sentinel Rock-Thrush, Mountain Wheatear (Chat) and Orange-breasted Rock jumper should also be searched for. 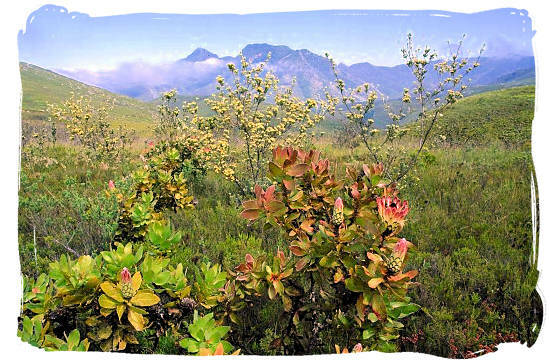 Fynbos and Renosterveld bush flourish in the temperate climate where the rains come mainly during early summer and winter. 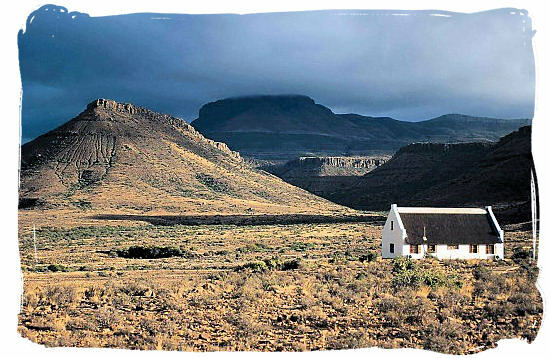 The unique Karoo vegetation includes Sweet Thorn, Karee, Karoo Aster, Globe Karoo, the wonderfully named Koggelmandervoetkaroo and Witmuistepelkaroo, Aloes, Kiepersol, trees, groves of wild olives in the high ravines, white Stinkwood, Camphor bush and Glossy currant. The Park is also home to 13 protected plant species listed on the red data list. 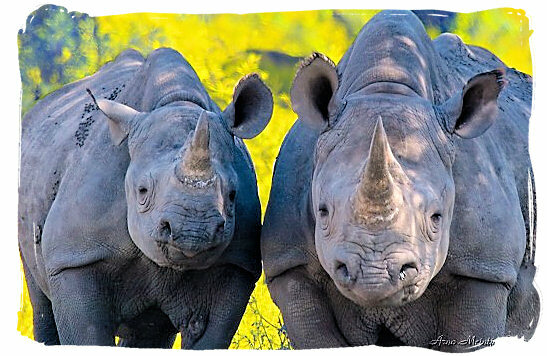 With panoramic views that are unrivalled and breathtaking and the Bankberg Mountains easing into large green plains and deep lush valleys, Mountain Zebra Park is one of South Africa's most beautiful places. In addition, visitors are rewarded with a very personal wilderness experience. Here they can move through the environment unchallenged by dangerous big game, yet enjoy a fascinating variety of wildlife in its natural habitat. 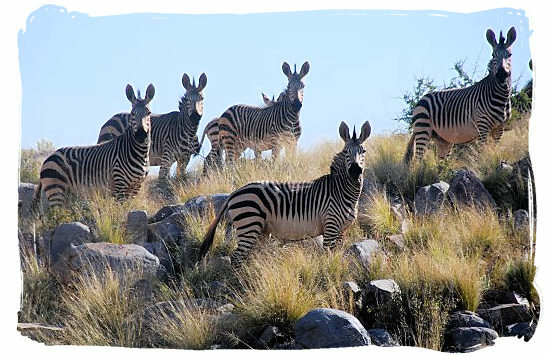 Mountain zebra National Park is situated about 25 km west of the town of Cradock in the midlands of the Eastern Cape Province, not far from Graaff-Reinet. The interactive map below shows South Africa, with a marker indicating the location of the Park. Zoom in to see a close up aerial view of the Park. Use the plus/minus button in the left-hand bottom corner or the the scroll wheel of your mouse to zoom in and out. Alternatively, put the mouse cursor on any location on the map that you want to explore and click repeatedly with the left hand mouse button to zoom in or out, without moving the mouse. The following Marakele National Park maps may also come in handy. View a map of the Park showing the locations of its rest camp and the Doornhoek guest house, click on the map to enlarge. View a map of the lay out of the rest camp in the Park, click on the map to enlarge. The average temperature of the summer period varies from a maximum of 23.1ºC - 28.4ºC to a minimum of 5.6ºC - 13.6ºC. The average temperature of the summer period varies from a maximum of 16.2ºC - 22.7ºC to a minimum of 0.05ºC - 7.8ºC. The winter months receive occasional snowfall, which falls mostly on the higher peaks of the southern mountain range of the park. Frost occurs May to October. 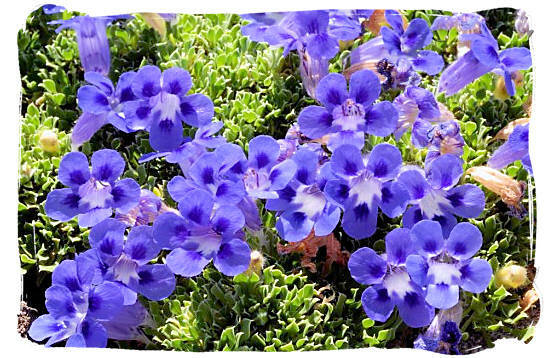 Annual rainfall is about 400 mm with the majority (70%) falling in the summer months (December to February). 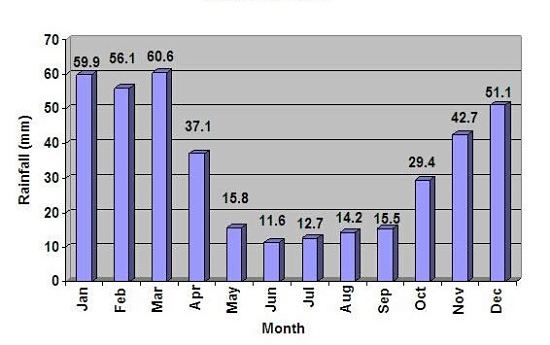 Average rainfall in mm per month for the Mountain Zebra National Park. Tips for navigating the maps that follow hereunder. First of all press the refresh button of your browser if the map does not show up properly. The three buttons at the right-hand top corner of the map allow you to view either the geographical map, the satellite picture or a combination of both. The button cluster on the left will enable you to zoom in or out. On the map you can use the PLUS (+) key to Zoom In for more detail, or the MINUS (-) key to Zoom Out for a bigger picture of the region in relation to the rest of South Africa. You will also be able to move the map left and right and up and down by clicking the left-hand mouse button and moving the cursor on the map. The map will center itself every time you double-click on the marker on the map. From Johannesburg you take the N1 south and continue for as far as Colesburg, then the N9 to Middelburg. Just south of Middelburg, turn left onto the N10 and continue for about 95 km until, about 6 km before Cradock, you turn right onto the R61 to Graaff-Reinet. After about 5 km, take the road to your left and from there the way is well signposted. From Port Elizabeth you take the N10 to Cradock. About 6 km past Cradock you turn right on the R 61 to Graaff-Reinet. After about 5 km, take the road to your left and from there the way is well signposted. There are signposts within the town of Cradock to direct you to the Park. From Cape Town you take the N1 to Beaufort West, where you turn right onto the R61 to Aberdeen. At Aberdeen you turn left onto the N9 to Graaff-Reinet. From there you continue with the N9 for about 46 km and then you turn left on the R61 to Cradock. After about 70 km you will see signs directing you to turn right onto gravel road to the Park, a distance of only a few kilometres. The town of Cradock does have a airstrip for light airplanes for those who own one or are able to charter one. Alternatively you can take an internal airlines flight from any of the major airports to Port Elizabeth and go by road from there. 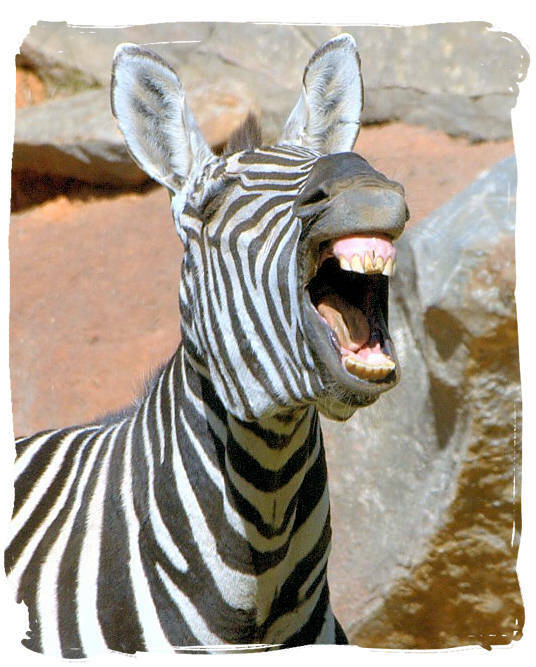 For 70 years, zebras at South Africa's Mountain Zebra National Park have had few predators. But now conservationists have reintroduced Cheetahs to the landscape. Featured in this video are two zebras fighting over a mate or territory. And some zebra crossing a river in the Mara, which is where zebra migrate with over a million wildebeest every June-July.